With highly accurate cyan, magenta, and yellow, this standard-capacity coloured ink cartridge produces long lasting and true-to-life images. Designed for low-volume printing, or infrequent large print jobs, the HP Genuine 57 Colour Ink Cartridge stands up to each task with consistently clear and high quality images. The HP 57 Tri-Colour Ink Cartridge (C6657GE) works with the DeskJet 450cbi Mobile Printer and Deskjet, Officejet, PhotoSmart, PSC, and All-In-One printers. It produces up to 165 pages, making it a convenient choice for those who need an occasional but impressive full-colour image. 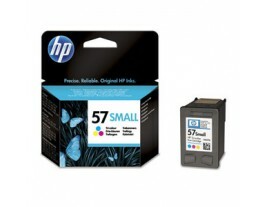 It is compatible with any printer that uses an HP 56 cartridge.